In the latest installment of the Dalai Lamas Cat series, His Holinesss Cat (HHC) is on a mission: to think less, to experience more, to live in the moment. She soon learns the proper phrase for this, being mindful, or, a concept better known to her as the power of meow. What ensues is a journey to discover her own true nature, to gain a deeper understanding of her mind, and to experience lifes greatest joy, the here and now. Throughout, she shares encounters with familiar inhabitants of Dharamsala, as well as a whole new cast of characters: a senior exec from one of Silicon Valleys most famous social media companies (hint: the name rhymes with litter), the Popes beloved dog (who shares a shockingly similar title: HHD, His Holinesss Dog), and a public health inspector who threatens to have our poor narrator banned from the Himalaya Book Caf. 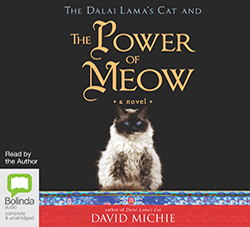 In this follow-up to the Dalai Lamas Cat and the Art of Purring, readers escape to the enchanting and exotic world of the Dalai Lamas monastery in the Himalayas, and take a peek inside the mind of a delightfully imperfect creature on the path to enlightenment. By accompanying HHC on her journey, you will learn new ways to relate to your own mind: slowing down, finding peace, and abiding in the boundless radiance and benevolence that is your own true nature.